We’ve decided to bring back everyone’s favourite Friday feature. 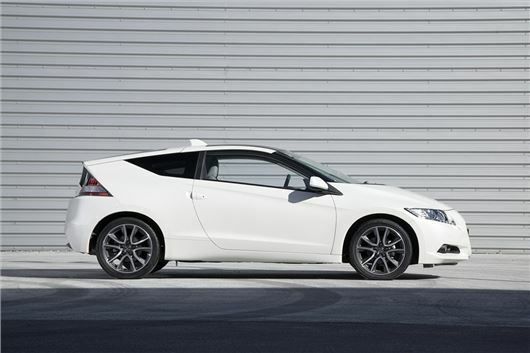 And we’re kicking it off with something suitably left-field – the Honda CR-Z. It was sold in the UK from 2010, but sales stopped in 2015 because it wasn’t a particularly popular with British buyers - though it’s still a hit in Japan. The spiritual successor to the 1980s Honda CRX, the CR-Z uses a 1.5-litre hybrid engine linked, rather unusually (for a hybrid), to a six-speed manual gearbox. It’s not exactly fierce when it comes to performance - 0-62mph takes almost 10 seconds and peak power is 120PS – but it’s a hybrid, so it’s obviously really frugal, right? Well…no. Not exactly. Economy is around 55mpg, which isn’t bad, but it’s hardly going to tempt in Mr. Prius out of his 70mpg, smooth, automatic Toyota. Perhaps it’s now becoming clear why the CR-Z wasn’t the most popular car in Honda’s history. But while it might not win in a game of hybrid or hot hatch Top Trumps, there is something Honda managed to get absolutely right with the CR-Z – its handling. The steering, chassis and suspension are excellent, giving pin-point precision and great feel. On a country road the CR-Z is seriously good fun. And its six-speed gearbox is beautifully slick, plus it has very well-spaced ratios, so you can appreciate every last little RPM without going way, way too fast. It’s a genuinely great car for UK roads. There are three drive modes – econ, normal and sport – which change the behaviour of the hybrid system and the ‘feel’ of the car. In econ mode, the instruments glow green and the throttle is less responsive, plus the hybrid system tries its best to save fuel. In normal mode, the hybrid system optimises itself based on your driving and the instruments glow blue, while in sport mode everything turns red, the throttle sharpens up and the hybrid system provides maximum performance. It all works very well, with quite noticeable differences in the car depending on the mode. It’s great fun, and yet it’s perfectly useable day to day. The CR-Z is a car that can be used for commuting through the week and for fun at weekends, plus Honda has a strong reliability record. Our £5000 budget is pushing things a bit – but head to a dealer and you’ll find loads of 2010-2012 CR-Zs for less than £6000 with low mileage and good history. A bit of haggling should get you a very nice example for £5000 – and that’ll be even easier if you’re willing to buy privately. You’re unlikely to find a higher spec GT model for that much, but that’s no big deal – the basic Sport model has climate control, cruise control and a good quality audio system. There’s no Bluetooth, though – and you’ll have to settle for fabric seats instead of the plusher leather on GTs. There aren’t many issues to look out for that are specific to the CR-Z, but there was a recall on early models over a potential problem with the hybrid system’s IMA motor. It was issued in 2011, so will almost certainly have been attended to, but it’s always worth checking. Otherwise, look out for the usual wear and tear on tyres, brakes and other perishable parts and check the car’s service history, as well as its online MoT history, for anything that looks out of the ordinary. And beware of some of the practical limitations, too – since there are plenty of them. The biggest of those is the back seats. They exist, but only as part of a sadistic joke. They seem to have been designed with a different species in mind, since the roof slopes so heavily there’s effectively zero headroom. Or knee room, for that matter. Or elbow room. Visibility is a problem too, since the CR-Z has a split rear window with a big chunk of plastic occupying the bit where you might expect to see any following traffic in your rear-view mirror. But those niggles aside, there’s a huge amount to like about the CR-Z. At around £20,000 new, they were just that bit too expensive – but now they look like a real bargain.